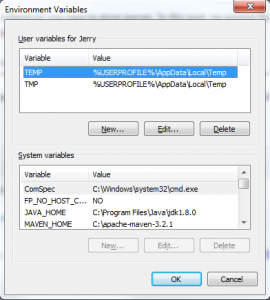 Share the post "How to Install Maven on Windows"
Maven is a Java build tool, JRE is not sufficient so you must have JDK installed in your system when installing maven on windows. First, download the latest stable maven from maven.apache.org/download.cgi . Download the binary zip version of maven. Next, unzip files to wherever you want to store maven. 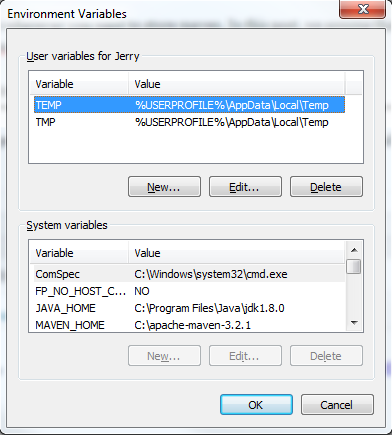 In this post, we assume that you extract maven folder in C:\ which means it should be in C:\apache-maven-3.2.1, 3.2.1 is the maven version. On System variables, make sure you have JAVA_HOME set in your variables. If JAVA_HOME was not set, then add this by clicking New. In Variable name field, add JAVA_HOME and in Variable value, paste the location of your Java JDK location eg. C:\Program Files\Java\jdk1.8.0 . Click OK.
Next, add Maven variables. First, add M2_HOME variable. On the same Environment Variables dialog, click again the New button. In Variable name field, add M2_HOME and in Variable value field, paste the location to where you unzip maven, in our case, it is in C:\apache-maven-3.2.1 . Click OK.
Click OK for the two dialog boxes to close. To test maven on windows, open command prompt by typing cmd on Start menu. Check first if Java Home was successfully installed in the system. In cmd, type java -version and your java version should be printed. That’s it! You have successfully installed maven on windows.